We are down in SoCal which is what Californians call Southern California. We are here to see a couple of days of the BNP Paribas Tennis Open. We have attended this event in whole or in part for many years. This year we are just catching the first two days. One of the things we enjoy eating while traveling is sushi. Light and filling, it is the perfect food. We stop at the hotel lounge and order some. 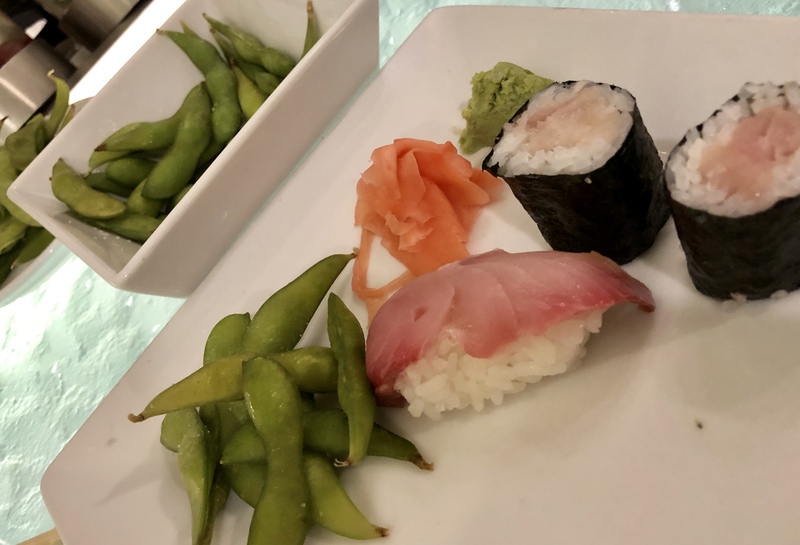 Our hors d’ouevre is edamame and then I have hamachi two ways, as a roll and as nigiri. John has hamachi and eel. Sushi is tasty and light. We see many of the professional tennis players here eating it. They are all in fabulous shape so they must be doing the right thing by their diets! This entry was posted in Dining out, Fish, Healthy tips, pescatarian, rice, Vegetables and tagged hamachi, Sushi. Bookmark the permalink.